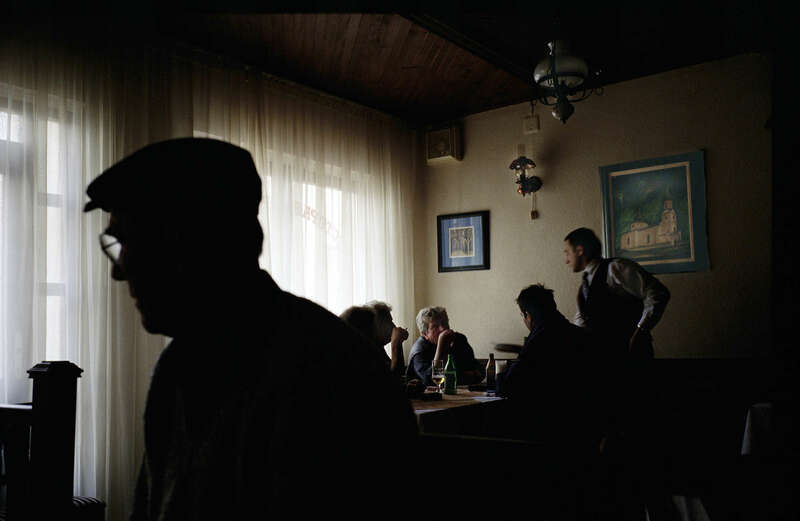 Aftermath: Bosnia's Long Road to Peace: Chapter Six: This Place: A Muslim tries to return after \"ethnic cleansing\"
A Muslim tries to return after \"ethnic cleansing\"
Dedo Fejzic, in shadow, was one of only a handful of Muslims to have returned to Visegard by the spring of 2002, after being forced out ten years earlier in an \"ethinc cleansing\" campaign by Serbs, which took the lives of some 2,000 Muslim men and boys in the town, including Fejzic\'s brother. Fejzic had filed the legal paperwork necessary to reclaim his tow homes, which had been occupied by refugee Serbs. He had known the Serb owner of this restaurant before the war, and liked him, but was uncomfortable eating there this day. He and his wife were also afraid to go out at night and were uncertain whether they would remain in Visegrad. Within a year, Fejzic and his wife had sold their property to a local Serb and moved to Sarajevo to be closer to their daughter.